The Pyrenées are, quite rightly, very popular, especially the areas within the Parc National. For the independent backpacker this has a downside. Wild camping is prohibited in the national park (although there are of course many discreet places where no-one would really know) and the refuges are invariably crowded and noisy. I wouldn't knock what the refuges have to offer. Here you will find good hot food, beers and mostly good company, but the dormitories are a nightmare; a hot, stuffy snore and fartfest seemingly populated by nocturnal incontinents who tramp endlessly to the latrines. 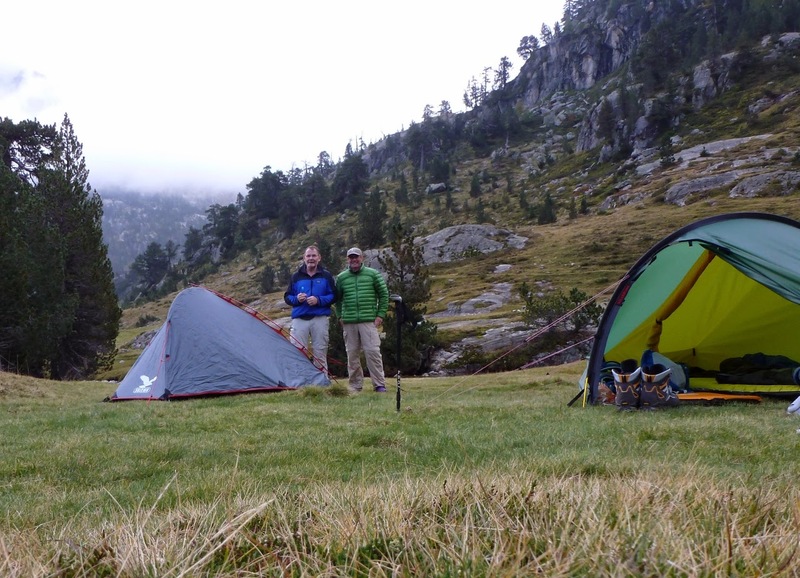 Following trips to the Picos de Europa and the Mercantour last year, brother-in-law, David & I had already decided that refuges are great places for food & drink and (in extremis) shelter, but on the whole we would prefer to camp away from the main building and have a bit of peace & quiet. But this decision means a change of kit - not just a sleeping bag now, but a tent too - and a stove perhaps for the morning brew. 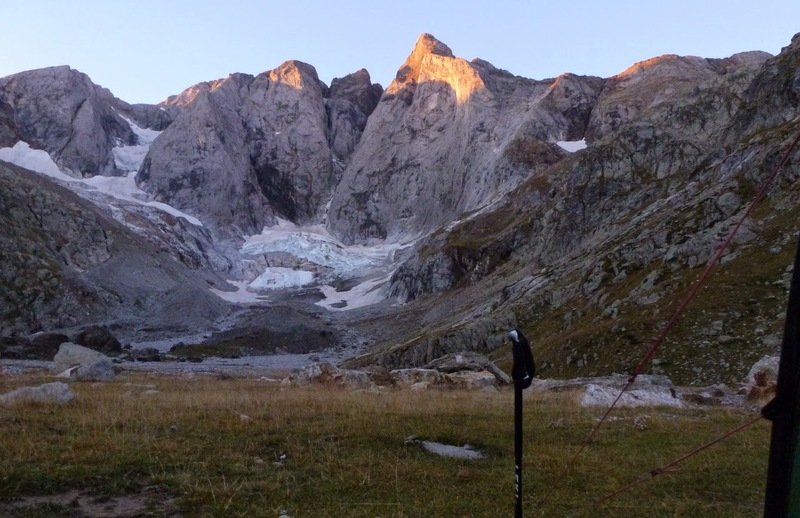 Most french refuges close at the end of September, and essentially this marks the end of the summer season in the mountains, and the beginning of an interlude before the first snowfall and the advent of the luridly clad skiing crowd. People are still around, but not that many, and certainly not in mid-week. What a perfect time to enjoy the honey pot areas. In the first week or two of October the weather is usually fine, without the beating sun and afternoon storms of high summer. The passes are all snow-free and the mountains are largely people-free too. 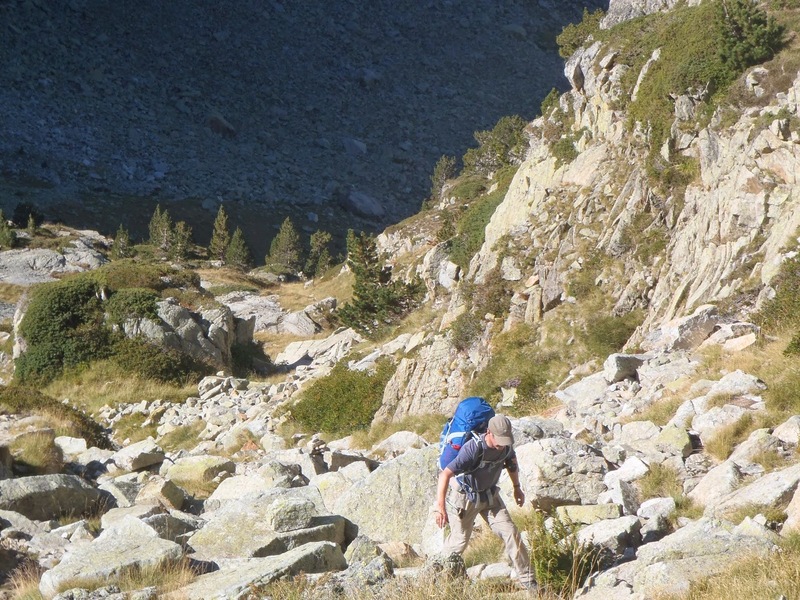 And so it was that on 30th September we picked up our hire car from Biarritz airport and headed off to Cauterets for three days backpacking in the Hautes Pyrenées. We stayed at the excellent Lion d'Or hotel in Rue Richelieu, an archetypal french family hotel. If you choose this hotel, try for a room on the third floor as, odd as it may seem, this is the most convenient for parking and carrying your bags in. 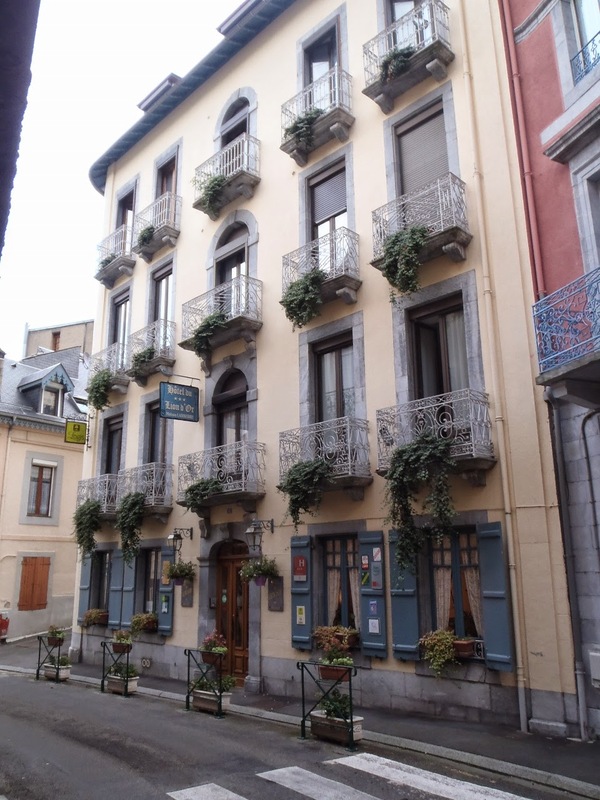 The town is built on steep hillsides, and there is a small car park on the Avenue du Dr Domer opposite the back door of the hotel which is on the third floor, connected to the road by a little bridge. Also opposite this discreet back door is the start of the walk, behind the impressive building that houses the Thermes César. And that is where, after a great evening meal in the town and a good night's sleep, our first day began. A wonderful fresh, sunny morning to set off! Behind the Thermes César is a small yellow sign indicating the GR10. It's a steep zig-zag path that climbs up to cross a small road past an abandoned bath house until it meets the Chemin des Pères. 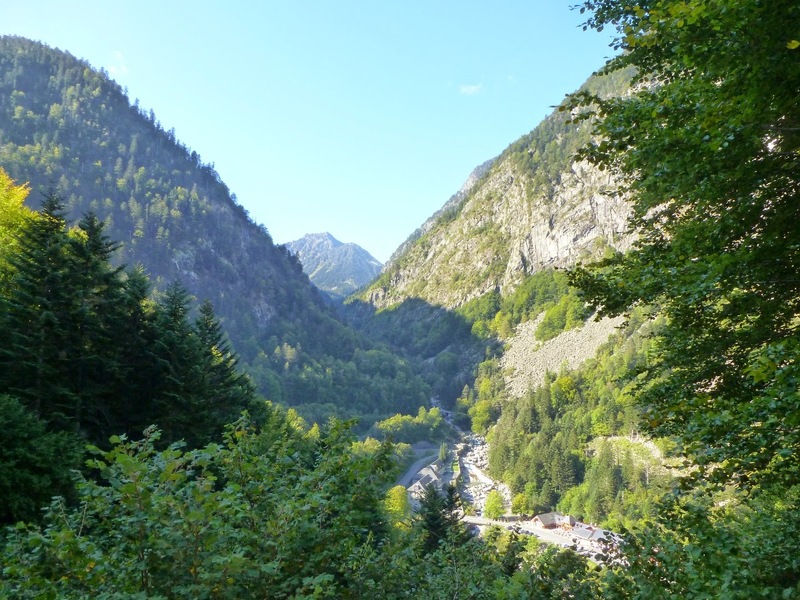 We headed south through pleasant woodland with dappled sunlight, punctuated with occasional views of Cauterets and then the valley below and ahead. 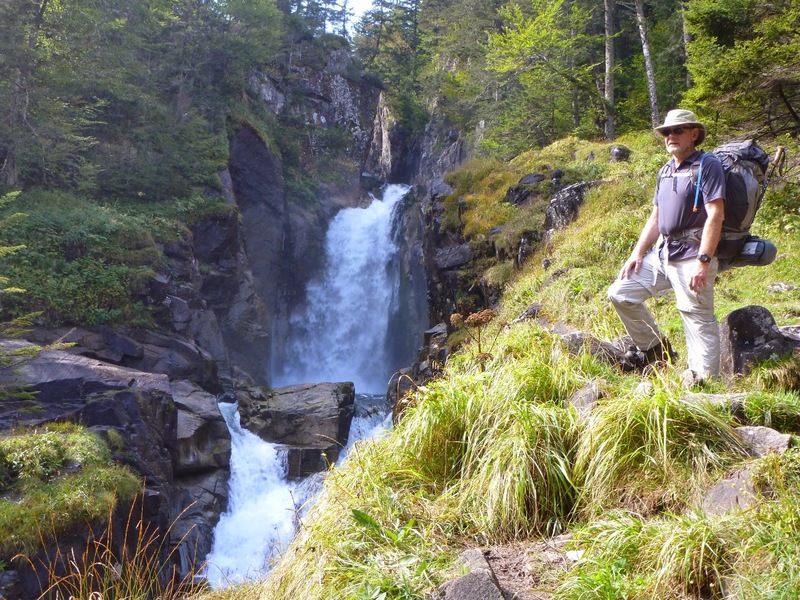 After 50 minutes or so of easy walking we cut down again to cross a bridge below the waterfall of Cascade de Lutour and headed down to La Raillère. 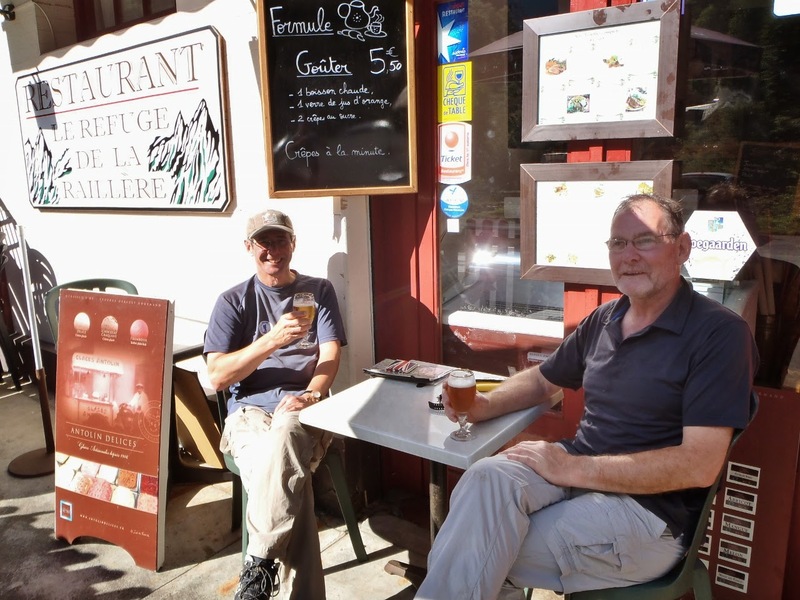 Here the big tourist joints were closed until the week-end, but a bar was open so we enjoyed a couple of cold beers in the warm sunshine before heading up to Pont d'Espagne via the Chemin des Cascades, which climbs through mixed woodland alongside the Gave du Mercadau. It's steep going up the rocky path, and there isn't much breeze under the trees to cool the perspiring walker, but the view points over the the crashing waterfalls give plenty of opportunities for "photo stops" ... and a bit of a breather too! Before too long we hauled ourselves up to the Pont d'Espagne, where the bar/restaurant was being prepared for its winter slumber. The huge car park below could be glimpsed as we approached, satisfactorily deserted with just a few cars scattered here and there. With the first haul uphill over, we now had an interlude of easy going to look forward to before the final push up to the refuge. We paused briefly before setting off across the broad Plateau du Clot. 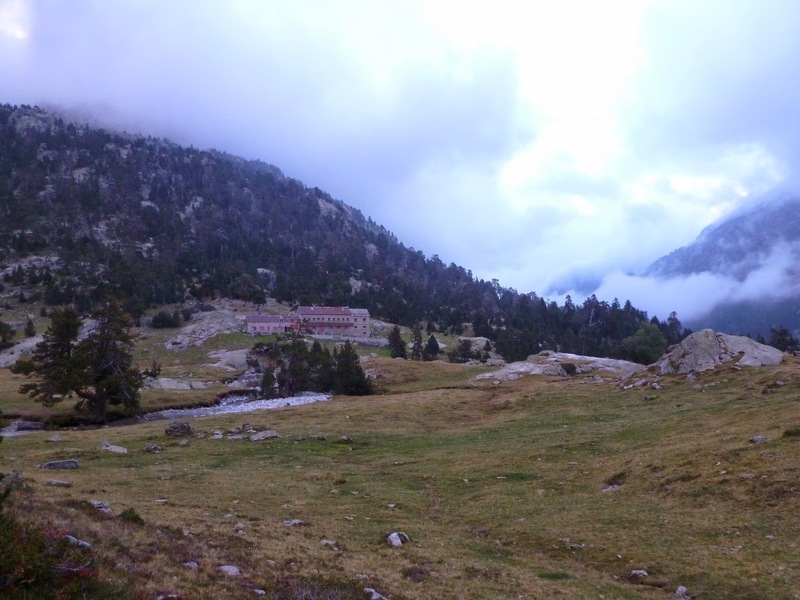 We chose to walk on the north side of the Gave du Marcadau, passing the refuge du Clot, which was still open for refreshments. Despite the temptation, we felt that stopping for more beers might be unwise, and opted for a brew stop and a proper english cuppa further up the valley. This wide, open area seems to be a popular spot for day trippers, and we noticed a few groups ambling along the track on the opposite side of the stream - for a while anyway. Soon we were entirely alone once more. The high mountains beckoned, and we crossed the Pont du Cayan at the end of this pleasant plateau to head up to the Refuge Wallon to camp. Path just after the Pont d'Estalouque - 3km to go! Save for a small group camping a few hundred yards away, we had the place to ourselves, with the spookily deserted refuge the only man-made intrusion in a wild mountain landscape. 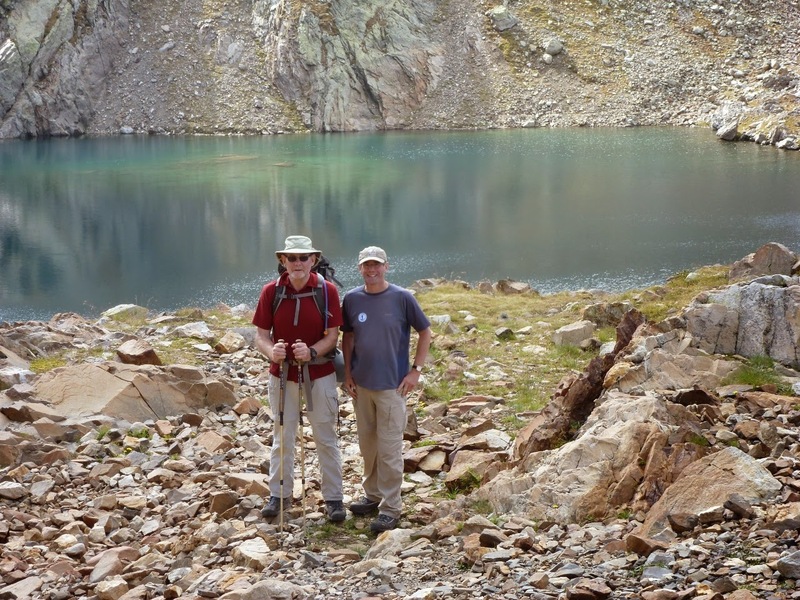 We were now well placed for our planned day two, slipping over the border into Spain before camping under the glaciers that still cling to the northern corries of Vignemale. Now, looking at the figures above, you would say that this would be an easy day, easier than day one, but it isn't. The paths get steeper and considerably more rocky. Non-stop I guess this would be 5 to 6 hours, but add some faffing about, a decent lunch break lounging in the sunshine, numerous photo opportunities, a bit of unexpected cloud and I guarantee you'll have a full day. But a very rewarding one, topped by stunning views across to Vignemale and a stunning camp site - even if we didn't actually see it until the next day! We inadvertently added that extra 1k noted above, and a good 100m of ascent by inattention (we were looking at the scenery rather than where we were going). 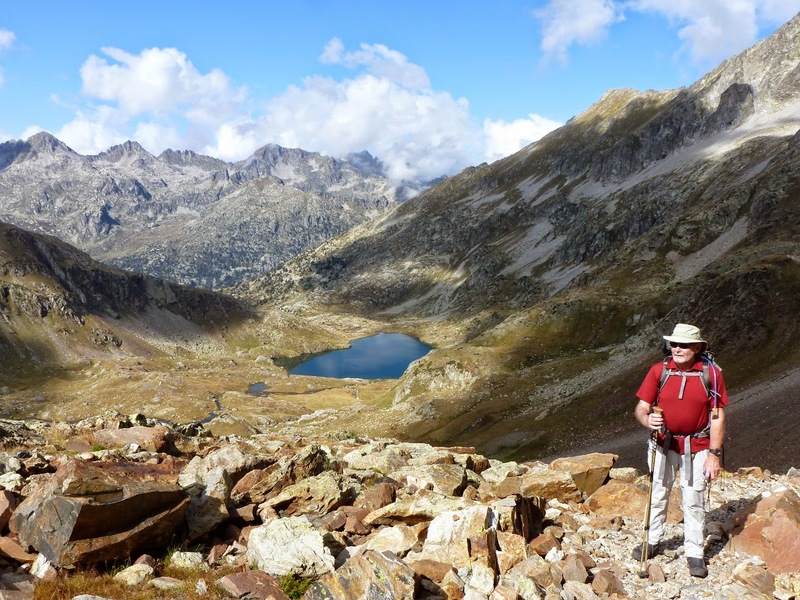 Our first error was going just a hundred yards or so up a false trail , easily spotted and remedied, but then, approaching the Lac d'Arratille I realised that we had strayed off to the east - not too much but enough to lose the path. No worries, said I, producing my latest toy, a Satmap Active10 unit with a 1:25000 IGN map card, with our route programmed in. I switched it on. Having been in "hibernation" mode, it locked on to the satellite signals almost immediately and displayed our location on the map. "That can't be right", I cried as I stared around us trying to make sense of the indicated position - half way up a mountain. David produced his gps and we compared notes. After about a minute of half believing me he established that my Satmap was, indeed quite wrong. Dave turned around and pointed to a stretch of water about four hundred yards away. "Would that be the lake we're looking for?" he asked. Well of course it was! A glance at the map and everything slotted neatly into place - but what of my Satmap? I'd only just bought it from a trusted friend. Could it be that my old pal, Andrew Walker, had sold me a dud? Surely not. And indeed he had not. A quick perusal of the "settings" menu showed that I had the device working on the British OS grid, which, projected to southern France, accounted for the error. Do-oh. However, with that minor glitch corrected, the Satmap was to prove very useful later on. 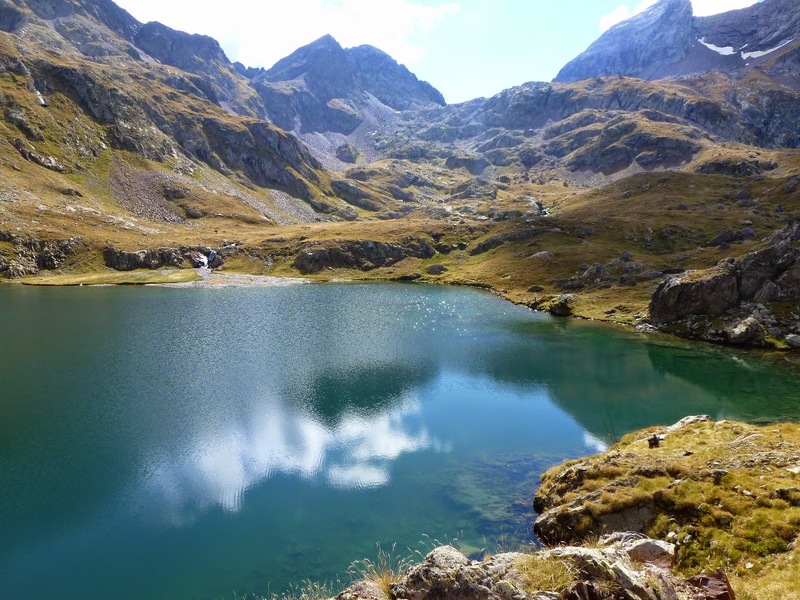 The Lac d'Arratille is a beautiful spot, popular with keen anglers who drive up the the Pont d'Espagne in the small hours and hike up here for a day's fishing - and today the half dozen hardy souls with rod & line were being amply rewarded for their efforts by fine weather and biting fish. The rest of the day was fairly straightforward - apart from being diverted by some old GR10 red and white paint splashes that veered to the west. 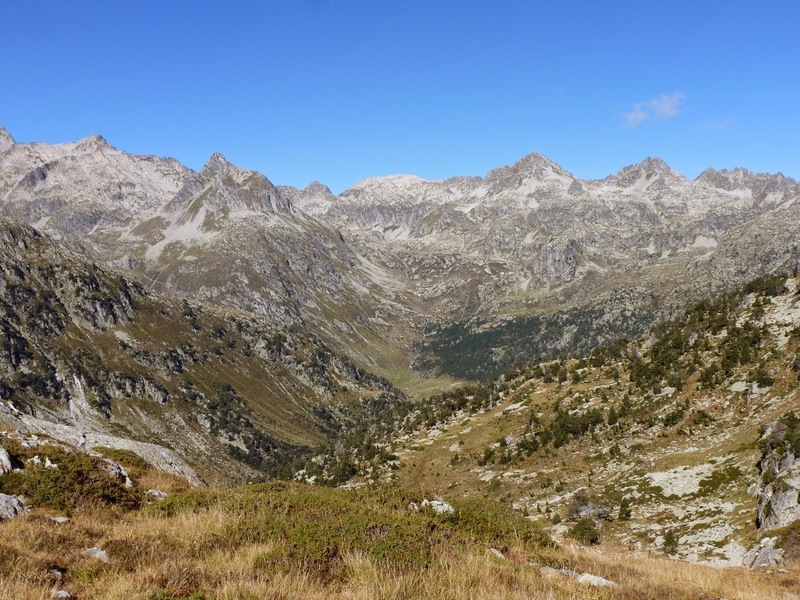 This time however we were on the alert for false trails, and swiftly moved back on to the scree path that leads up to the deep green Lac du Col d'Arratille and thence over the col into Spain. The pictures below are quite small, but you can click on them to see them full size, as with all the pics on this blog (I say this 'cos I was asked why I kept putting such little pictures in my posts!). 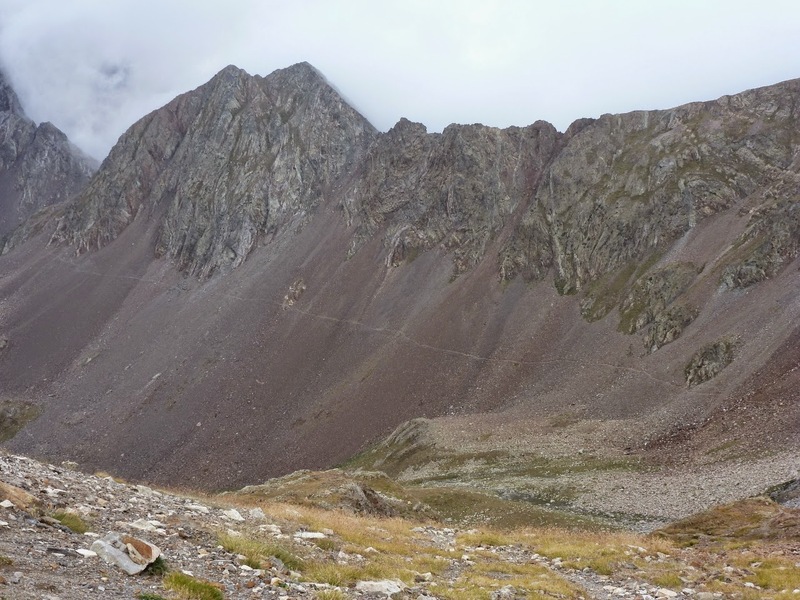 The path across the scree slopes eastward to the Col des Mulets for re-entry into France looks exposed on the map, but is in fact mostly well dug into the slope and there is no feeling of insecurity as you plod on to the steep ascent to the col. Here a well earned rest was taken and we enjoyed the view back. However, now the sun had gone and clouds were drifting up from the east. High above a couple of eagles, or perhaps Lammergeiers, soared in and out of the shreds of vapour. 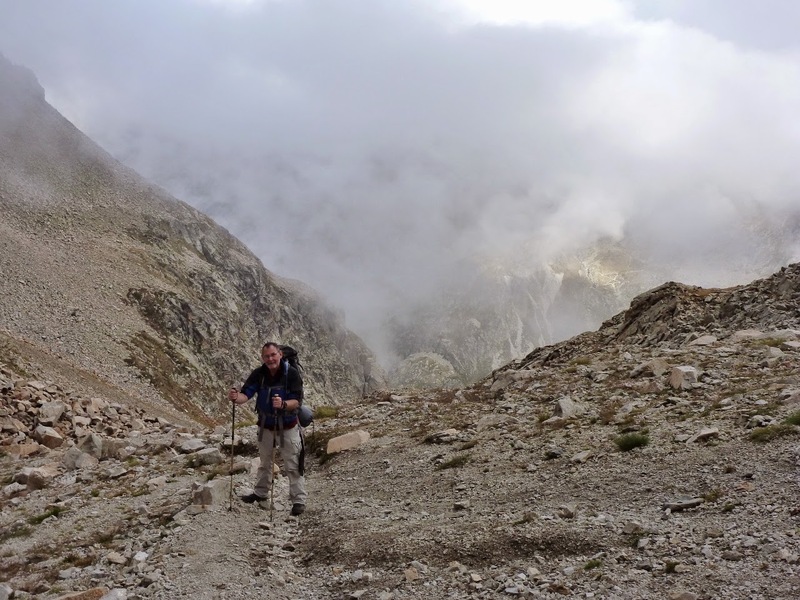 It was time to commence our descent to the camping area below the Oulletttes de Vignemale before the visibility deteriorated too much. This is not a pleasant descent. It is rocky, unstable and very tiring, and needs to be taken with care and a degree of circumspection. Added to which the cloud base was now descending as fast as we were, which added a certain sense of urgency. Then more cloud started to roll up the valley to meet the stuff above, so we were very pleased to reach the lower slopes and still be able to see our surroundings reasonably well. We cut directly across to the plain that is the outwash from the Vignemale glaciers, and, now in dense mist, headed down the valley. Just as I was about to call a halt (and we were pretty tired by now) I fancied that I saw lights in the distance. 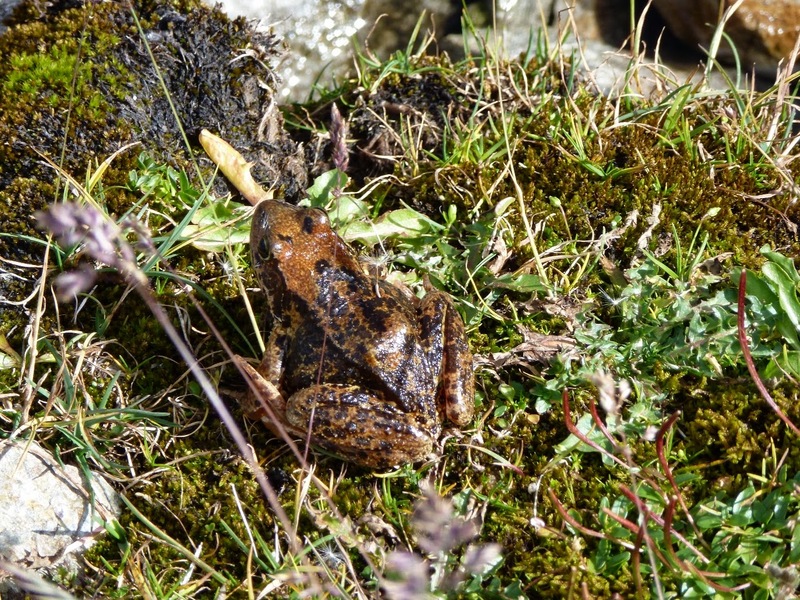 It could only be the Refuge des Oulettes - evidently occupied! I encouraged David, who I think was ready to put up his tent, to follow me to the refuge which eventually loomed up through the darkening fog. A splash across the stream outside, and we were inside. It was a meeting of the youth section of the Club Alpin - all very welcoming chaps, it has to be said, but sadly, in the absence of the "gardien" there was no catering that evening and, even worse, no beers!! They kindly offered a couple of berths in the dorm, but having decided to avoid the snoring and general insomnia of refuge life, we opted to return to our intended camp site on the bivouac area on the outwash plain. The slight problem now was that the cloud, mist, fog - call it what you will - was so thick that we literally could not see more than three yards ahead. Saved by the Satmap! Switched it on, activated the map to 'direction of travel', and we walked directly to our chosen camp site without any problem at all - no tedious map compass and pacing, just follow the blue dot and pointer on the display. It really is an outstanding piece of kit. And we slept well that night - apart from the odd explosion. At least that's what it sounded like, Throughout the night at least four large chunks must have fallen off the glaciers with a loud crack, bang and a rumble of falling rocks. Enough to make me peer out of the tent at one point, to see the mist gone and a clear sky with stars and moonlight picking out the high peaks that surrounded us. Just magical. I awoke early enough to catch the first rays of the morning sun catching the the towering peaks of Vignemale in blood red light against an egg shell blue sky. What a view to have when you're enjoying a morning cuppa! Today's route was a straightforward descent down the Vallee de Gaube on the GR10 to the Pont d'Espagne and back to Cauterets. Once again the scenery was superb in the bright autumn sunshine, and glance back up the valley showed us once again just how magnificent the country we had passed through is. The Lac de Gaube boasts a small hotel and bar, but sadly this too had closed at the end of September, so we found a comfortable spot to sit down and enjoy our final lunch, polishing off the remaining saucisson, mountain cheese, bread and apples. Then one last route decision. Did we keep the views by staying high and following the level track to the ski lift above the Pont d' Espagne, and then walk down the ski run, or follow the path down through the woods. As the ski run looked pretty steep and our knees were feeling the descent, we opted for the shady path, and very pleasant it was too, although rather eroded in places by the thousands of tourist feet that make the climb up to the lake from the Pont d'Espagne car parks. Autumn Crocus by the Lac de Gaube - we saw these flowers on every day of our walk. Then, having done the Chemin des Cascades on day one, we simply ambled down the quiet road to La Raillère and back to the bar, where beers were consumed and we relaxed after a thoroughly enjoyable promenade. From La Raillère we took a recommended pedestrian route that goes past the deserted spa building and then crosses the main road onto a quiet lane that leads to a bridge which, when crossed, puts you on the Rue de La Raillère and an easy stroll back to the centre of Cauterets, and, in our case, another comfortable stay at the Lion d'Or, which left Saturday morning free for a bit of shopping before heading back to Biarritz for the flight home. 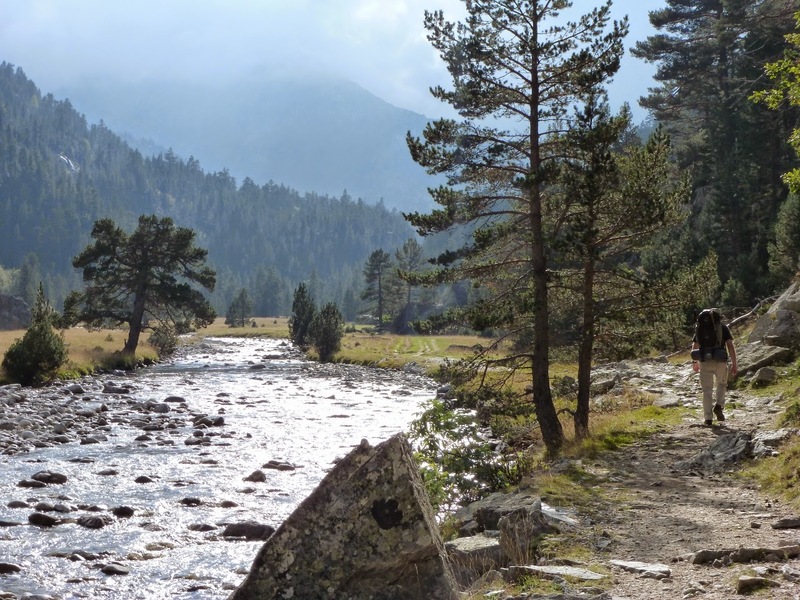 This was easily one of our best, if not the best, getaway excursion to the continent that we have had so far, and if you think you'd like to give it a try, I can thoroughly recommend it as an introduction to the Pyrenees. Do be aware, though, that snow can persist on the high passes through May, and sometimes into June, so in early summer it may be advisable to check conditions. That caveat aside, here is a little practical information on travel and costs. So the basic travel cost works out to £222 each, which really isn't too bad. Accommodation costs depend on what you intend to do. It is from around £55 pp per night in a decent hotel, or there are some pretty good campsites in the area, like this one. Evening meals in Cauterets are pretty reasonable too. If you cook by gas, canisters being banned on aircraft, one of the problems that you will have on arrival is finding a shop that stocks canisters, and in particular the screw-in type. No worries here. Although The Inter Sport shop and a couple of others were closed for holidays, and the remaining outdoor shops only seemed to sell clothing and ski gear, the lady at the tourist information office directed us to a little hardware store, Catena, 21, Rue Richlieu (almost opposite our hotel) where most types and sizes of canister are available - including the very small ones that we wanted for our couple of nights out. The only question for David and me now is, where next? 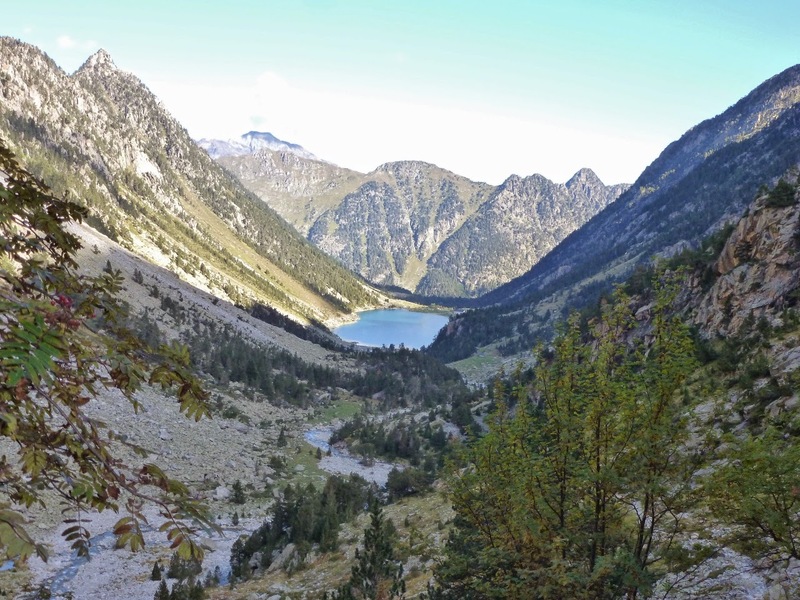 We've now had jaunts in the Picos de Europa, the Mercantour and a couple in the Pyrenees. It's a tough call, but I think we could be back in the Pyrenees next year! I do so like the Pyrenees. I shall go back when I have this 10th bloody TGO thing sorted. Thank God the Satmap worked OK. I see you have a natty green jacket. I can sell you a Warmlite 2R that matches that for about the same as a Satmap. I see Dave has stolen my belly. I was wondering where it had gone. It's ok though. He can keep it. I was fed up with lugging it around anyway. Thanks for posting. As someone who wants to get to the Pyrenees this has further wetted the appetite. Just a note of caution on when to go; The snow can linger quite a long time. I went to this area mid June and there was still quite a lot of snow over the passes, especially so on the north and western slopes. Just to add to Al. We went in August. It was 80 dog F and there was still snow on sheltered slopes. That was degrees. Damned these typing thumbs. "80 dog" has a nice ring to it. I shall nick that one, Ta. Oi, Walker! Less of the dissing David. That's my brother you're talking about. Yes, Al & Andy, both persisting snow areas and afternoon thunderstorms can be a problem in the early summer. In fact thunderstorms are quite common through to the end of August. Mostly local weather forecasts will be your guide, and if you're walking whilst the refuges are open, the gardien will usually have reliable info from his clientele as to conditions on the passes. Glad you seem to have liked our little wander in the mountains. A very stunning place Phil. Damn fine trip you had there. Paul, another route for your 'to do' list coming up! (sorry). I've only just found this––makes a great read and I'm glad you and David enjoyed the trip so much. Re. next year or the year after that, how about Canada? There are plenty of wild hiking places over here! Only just found your comment - I'd forgotten that I'd redirected the comments to a different address during the Christmas holiday!